A man's cologne should be refined, elegant and classic. 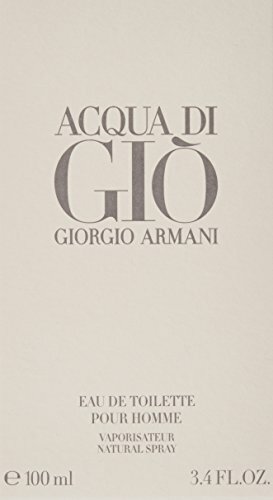 The Giorgio Armani’s men's fragrance has become a timeless reference, the quintessence of the Armani style. A crisp and lively aquatic splash of woody marine freshness, this sea-inspired limited edition cologne stands out among men's fragrances. Wrist, inner elbow and neck. Light, aquatic nuances mix with jasmine fragrance, crisp rock rose, rosemary, fruity persimmon. With a warm Indonesian patchouli to create a men's fragrance that is both fresh and sensual. This aquatic, hyacinth fragrance opens with a splash of fresh, calabrian bergamot, neroli and green tangerine.